ASSC Part 2 Ready to cook! 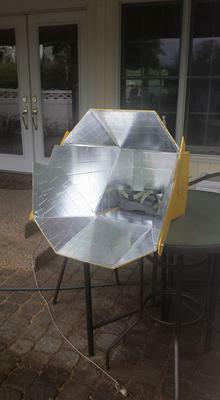 This week, I finished the All Season Solar Cooker. As said before, I like that you can build 2 from the plans...because I had a *few* learning areas on my first go-around. The main thing that I have to figure out is making the sun sight. I have to find someone that has a table saw that I can use to make the cut on my block. I was not as patient as I should have been with applying the tape. My tape is not as smooth as it probably could be. It is primarily cosmetic, but I might want to take a little care on my next model. I attempted a last minute thermometer check yesterday while I was teaching to see if I could get a reading on how hot it might get during the day, but I was unable to really get a look at it or move the ASSC while teaching in order to track the sun for most of the day. As I prepared for that test, I saw that my pyrex bowl system didn't really fit. I shoehorned it in there, but it was a little more tight than it seems in the online videos - i heard in a youtube video that the store-bought version has a 12" cooking space, whereas the plans are 11. No biggie! Will post later once I get the sun-sight made and get some data. This is where I think the ASSC should have a chance to shine (forgive the pun) with its ultra-low setting in "Winter mode" - - I just need to find out if it will truly develop cooking temps at 9:30-10am and if I can find a way to quickly train up 8th graders in how to construct it well. Comments for ASSC Part 2 Ready to cook! Looks like you did a really good job! The next one will be easier. And once you have one "good one" constructed you can use it as a pattern for the students. You will definitely be able to cook in the morning. I do all the time. Eggs are easy. I make a frittata with spinach and mushrooms. EZ morning meal. Lentils, rice, quinoa, are all easy. Dried beans, however, require several hours (as they would on a stove top) so those are an "at home weekend" adventure. If you cook meats, be sure to use a food thermometer. And don't worry about overcooking. I let my chicken cook all the way to 200 inside temp, and since i cook covered, the chicken is always tender and moist. 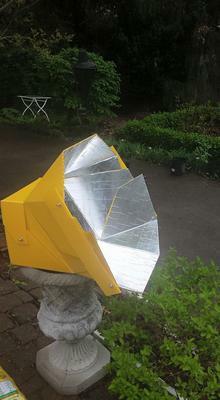 Contact me under separate message regarding a sun sight. Again, congrats on your build. Any wrinkles will not hurt one bit.